This marks 100 issues of Migratory Notes. We launched the week after the first travel ban went into effect as a pop-up newsletter to keep up with the deluge of the news until it subsided. That was two years ago this week. If anything, the pace and intensity of immigration news has only increased. In this special issue, we are highlighting stand out stories from 2018 that revealed how U.S. immigration policies are impacting communities via incisive, innovative and compelling reporting. In the past year, zero tolerance at the southern border, and in particular family separation policies, captivated coverage. Then for weeks the caravan of a few thousand migrants took precedent, seemingly, over all immigration stories. As a result of the border focus, we also observed too little probing coverage on other important immigration issues this year, such as workplace enforcement policies, DACA in limbo, and the ongoing repercussions of the travel ban. We’d love to hear from you: What are the big issues that you think are not being covered enough? And please keep sending us stories and opportunities that you think Migratory Notes should include moving forward. Thank you for reading, and supporting our pop-up to reach 100 issues! 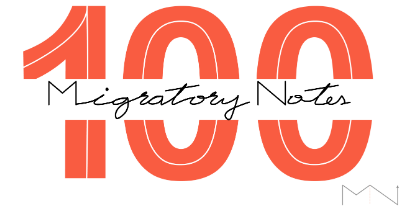 Thank you for reading Migratory Notes, and supporting us to reach 100! Daniela and Elizabeth in LA, Yana in Chicago, and Anna-Cat in San Salvador. We are grateful to Phuong Ly, Mirta Ojito, Fernanda Santos, and Roberto Suro for their insights, and to Angie Quintero for designing a special logo.